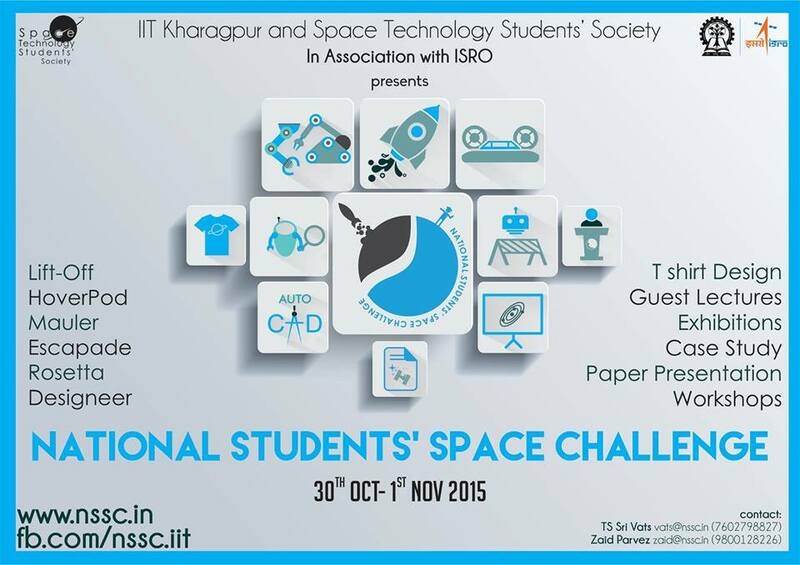 National Students Space Challenge (NSSC), a national-level engineering competition organized at IIT Kharagpur each year. The competition is certified by Indian Space Research Organisation and receives participation in large numbers from engineering students from all over the country. The event is the sole technical fest of its genre encouraging space enthusiasts to showcase their mettle in various fields of Astronomy and Astrophysics. It was conceived by Space Technology Students’ Society, a group of IITians from various disciplines working towards a common goal of motivating space interest among the student community of India, emerging as one of the major forefronts in the field of space technology. This year NSSC is to be held from 30th October to 1st November. NSSC ’15 promises you 3 days of non-stop action witnessing a showdown of ground and underwater robotics, water rocketry, coding, overnight experience and an entire plethora of competitions for the engineering brains out there to bag prizes worth more than 5 lakhs. In addition to this we are having a series of workshops and guest lectures by eminent astronomers and personalities over the globe. We have also provided the students with a chance to participate on-line before the fest through many events. Along with other exciting events there will be Amateur Astro-photography Competition which is first of its kind for college students which will provide a nationwide platform for the students to show their skills and talent. NSSC’15 has a blend of many mechanical, robotics, designing and documenting events lined up. All the details regarding various events that will be conducted in NSSC ’15 along with their Problem Statements are available at https://www.nssc.in/. There would be many online events launched in the run of NSSC’15.